First off, it’s the right thing to do. If you have a single self-reliant bone in your body, you understand what I mean. This goes for survival experts as well. Even if you can make fishhooks out of pop-tops, fashion hunting bows from plywood, and turn a shoe into a water filtration system – those last resort measures. And not a good plan for dire emergency situations. Having a well-stocked emergency supplies kit, and some bushcraft gear at your disposal is smart. And in the long run, it can be more important than any fancy survival trick. I am not saying a survivalist is only as good as his equipment. Being creative and adaptive in survival is still essential. But having a good survival kit always improve your survival odds. It’s important to know what goes into a quality survival kit for two reasons. First, you’ll know if it’s truly comprehensive or missing an essential item. Basically, you’ll know how to identify a high-quality kit from a poor quality kit. And second, this list will help you build one. And even if you do end up buying one instead of building one, you’ll see extra items you’ll want to add to one you’ve bought. There are no rules against customization – in fact, it’s highly encouraged. 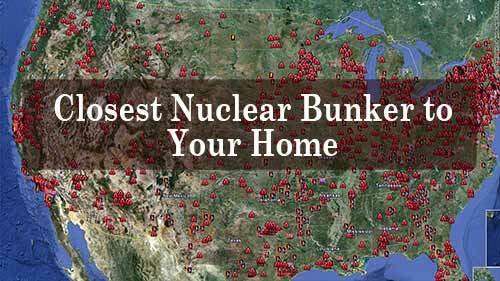 But, here’s the problem – a lot of you survivalists already have their Bug Out Bag packed and ready. And when we cover in detail what’s inside a kit, you might notice some crossover between the two. So my advice is this: redundancy is never a bad thing when it comes to survival. Having extra fish hooks and dehydrated meals is never bad. And many of those items, weigh little and are easily packed away, without taking up a lot of space. If the crossover bothers you, you may want to include just those items you don’t have yet. As opposed to building a second “Survival Kit” that’s almost identical to your Bug Out Bag. Before discussing any survival gear, you need to make food and water a priority first. Without proper hydration and energy, a small emergency can quickly take a turn for the worst. Clean drinking water is critical for survival situations and from your water taps in everyday life. Survival water filters and purification tablets should be one of the first things you put into any survival kit. Iodine tablets are very useful and take up almost no space inside your kit. Survival water filters work even faster than iodine so get a couple of portable ones; like a Sawyer Mini. Here’s my video review of the incredible Sawyer Mini. Sustenance is one of the pillars of survival. Without it, you starve, shrivel up and die a miserable death. Calories are energy, no matter how you’re storing them, so keep some form of food storage in your emergency kits is essential! It can be as simple as a few energy bars or some freeze-dried dehydrated meals. Some people prefer energy gels, packets of peanuts, trail mix. Another great survival food for your kit is called Pemmican. This survival snack was originally invented by the Native Americans for their own survival needs. It’s a protein dense survival superfood that can last decades without refrigeration! Avoid relying on candies and other food with high sugar content. They will give you a short burst of energy and then you’ll feel more tired once it’s quickly used up. The bottom line is to make sure to stash a bit of emergency food in all your survival kits. If know how to use one, pack survival knife. But even a small credit card knife can achieve a lot in an emergency. Knives are one of man’s most important survival tools since the dawn of time. And that remains much the same today – don’t get caught unawares without one. ESEE makes a quality survival knife but it’s nearly 12″ in overall length. So if you’d rather pack a compact survival knife – one that easily fits into a smaller emergency kit – check out The Survival Neck Knife. I carry a Ferro rod, a set of waterproof matches and a survival lighter in my survival kit. Because fire is one of man’s oldest survival tools so if you don’t have a way of making one you’re under-prepared. Of course, there are a lot of ways to start fires without matches and lighters. But those methods are complicated, time-consuming, and less reliable. Instead, pack a set of stormproof, waterproof matches. Because you should never make surviving an emergency any harder than it needs to be! You want a small medical first aid kit, not a full EMT emergency trauma kit. Those large medical kits will consume nearly all your available packing space. Sure, you’ll be prepared for just about ANY medical emergency but that’s it. You won’t have room for all the other necessary survival supplies. Instead, get a smaller first-aid medical kit like the Day Tripper Medical Kit. It has all the basic medical tools and supplies you need for most emergency and survival situations. Whichever first aid kit you ultimately choose, it must include Band-aids, antibiotic ointment, alcohol swabs, and some clean gauze at a bare minimum. Also, check out our in-depth article on how to build your own medical kit. There’s nothing that can turn an emergency from bad to worst than being lost. That’s why every emergency kit should include a compass. It doesn’t have to be an expensive compass or even a high-tech one. It just needs to be a compass you can rely on to point you in the right direction. Inexpensive compasses are easy to find, just make sure that it’s reliable. Once you’ve found a cheap, but reliable compass like this; put one in every bag you own. Your bug out bag, your hiking backpack, your purse… wherever! A compass is a useful survival tool to always have on hand. In wilderness survival, fishing is one of the easiest and most reliable forms of calorie acquisition. Fish make for excellent survival protein, and you can find them in most bodies of water. And you don’t need a fancy pole and reel setup to catch one. Some bait, a strong line, and a hook is all one needs to catch a fish in a pinch. And patience… lots and lots of patience. Emergency sleeping bags, “space blanket,” or bivy sacks as they are sometimes called, are essential for all Survival Kits. They pack small and look like tin foil than an actual blanket, but these survival devices retain heat. They were originally designed by NASA (hence their nickname “space blanket”) for astronauts. But they work just as well for cold survivors down here on Earth. Of the ones we’ve tested here at Skilled Survival – The Tact Bivvy by Survival Frog is our favorite. The traditional American “fix-all” tape. Duct tape is highly useful for everyday tasks and emergencies. It allows you to build and repair just about anything you might have on hand in a survival situation. And today’s T-REX duct tape is even better than original versions of this stuff. Nowadays it’s all weather, it’s stronger and lasts longer. When it starts raining in an emergency you must stay dry. Hyperthermia is extremely dangerous, especially in an emergency. And if you’re stuck outside, with no house, no buildings, no cave, or other natural structure to seek refuge in, having an emergency poncho at your disposal is crucial. Having two is even better – then you won’t have to share yours if you have a companion. These little devices can be lifesavers. Not only will they provide some emergency hands-free lighting. They can also provide a recuse beacon for search parties. They are inexpensive, simple to use, and easily fits into any size kit. Let’s be honest – none of us can predict the sort of emergency we’ll end up in. And if it’s one that includes fire, smoke, ash, dust, particulate matter, or other discharge of similar nature, then you are going to want a dust mask. These protect your respiratory system from pollutants and toxins. They are cheap, lightweight, and easily pack away. Or you can upgrade from a dusk mask to a full-blown gas mask for more dangerous chemicals in the air. The applications for these are nearly endless. Nitrile gloves are important when working with injuries. They’re useful for cleaning nasty things (like toilets), or toxic materials. So stuff a couple of pairs of these into your survival kit. You never know what you’ll need them for, but you can be almost certain you’ll need them for something. While you might have a loud shouting voice, survival whistles are always better at alerting people. No matter how loud you think you can get, your voice will not carry as far as a whistle. 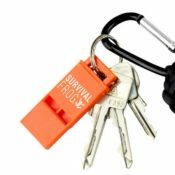 You should check out the Scream Whistle by Survival Frog. Not only is this whistle light and compact but it’s extremely loud. Plus, at the time this article was published, you could get a FREE Scream Whistle (just pay $3.95 s&h). Click here to see if this incredible deal is still available. While you never want to rely on lots of survival gadgets that require batteries, it still makes sense to carry one for your survival flashlight. I recommend packing a survival flashlight that’s super bright and only requires a single AA battery. No matter how bright a flashlight might be, you don’t want to deal with special battery sizes. That way you can pack an extra battery of the same size (AA) and you’ll have a flashlight for any emergency or survival situation. I don’t know what kinds of injuries I’ll be dealing with in a future emergency – and neither do you! Biohazard bags are the kinds of things you do not need until you need them. A deck of survival playing cards, a cribbage board, a book or magazine can make a huge difference in a survival situation. Entertainment can preserves one’s sanity in stressful situations. An emergency kit without some form of distraction (like a deck of survival cards) is incomplete. Do you wear contact lenses? If so, then you should stash a spare pair in your emergency preparedness kit. Being able to see in a crisis is essential, contacts can fall out or get debris in them. Do you take insulin or special medications? Obviously, you need to add some spares of those critical items to your kit as well. Think about the items specific to you and your health and add them to your preparedness kit. Not every emergency kit is going to have all the critical survival supplies. They come in all shapes and sizes and sometimes there’s not enough room. Some are big and bulky and will last four people for days. Others are small enough to fit inside of a bug out bag or backpacking pack. I recommend assessing your needs and then finding the one that’s right for you and your budget. Here are a few of the most comprehensive survival kits you can buy. These kits have just about everything you can think of for most emergency situations. We’re starting with the biggest (most comprehensive) survival kit on this list. This full sized backpack emergency kit is equipped to sustain four people for three days in an emergency. It has almost everything we talked about above, and even a few more items not listed. The pack is ideal for families. However, it’s the most expensive kit we’ll discuss (check out today’s price). And for a good reason: it’s the most comprehensive and the largest. It’s got a lot of survival supplies at a reasonable price (check out today’s price). If your looking for a comprehensive urban survival kit that doubles as a bug out bag, look no further than the Urban Survival Bug Out Bag. This kit includes all the basic equipment you need for a successful bug out, including gear and supplies. Plus, these bag’s are colored to blend into the urban landscape environment since they are a simple black and gray combination. For all you get, the price is surprising (check out today’s price). This small, easy to carry survival pouch contains a ton of survival tools and supplies. Multi-tools, a striker, a compass, a portable wire saw and emergency whistle, among many other things. All these high-quality tools and supplies for an insanely fair price (check out today’s price). This kit is great if you plan on storing your survival kit inside of another bag because it’s so small. This kit is another small option, containing all the essential items without the bells and whistles. This is the bare bones of a survival kit, and it’s in the mid-price range (check out today’s price). But with the Gerber brand name you know you’re getting some solid survival gear for your money. As I mentioned before, even if you bought a commercial survival kit, it is a good practice to customize it. Survival is all about thinking outside of the box. It’s a creative art that requires improvisation skills. Apply that towards perfecting your survival kit. The more time and thought you put into this project the higher the payoff when the time comes to use it. A survival kit is the kind of asset that makes the difference between a chaotic and difficult struggle, and a manageable challenge. With a single bag, you can prepare yourself for the worst emergency. Now, as I mentioned, there is a lot of crossover between “Bug out Bags” and survival kits. THIS IS OKAY. I recommend against supplementing one for the other. Why not have both? Even if they are roughly the same and loaded with a lot of the same supplies, it’s good to have two. It means you’re doubly prepared in the event of an emergency. Redundancy in survival is often a good thing, do not be afraid to have more than one of the same survival tool. There are so many survival kits on the market, all advertising a different list of contents. That is a lot of options for prospective buyers like you. And it can sometimes be overwhelming trying to pick the right one. Use this guide to provide insight to get the perfect survival kit for you and your family. Regardless of whether you choose to build your own kit or buy one, make sure you keep it at the ready. Ensure that your fate is in your own hands. Prepare yourself with reliable gear, and an ultimate survival kit. A “good” survival kit is one that you build for yourself, based upon the requirements dictated by your projected survival situation. I live in the Southwest desert of the U.S. My survival kit requirements are largely different from those that an educated prepper would require in northern Maine or North Dakota, or southern Georgia, for that matter. I’ve looked at many of these over priced store-bought survival kits and laughed. Please don’t waste your money. A survival kit will not keep you alive if you don’t know how to use it. A kit that contains unreliable and unneeded items will not keep you alive, even if you know how to use them. I personally bought the one from Wise for my sister who lives in New York. I did add some extras to it. But he is right, you have to have some type kit.